The name of "Ed Harris" is certainly not an unfamiliar one when it comes to Hollywood's A-list of actors. His name as a director, though, is a bit less recognizable. Eight years ago, Ed Harris made his directorial debut with his poignant and sincere portrayal of artist Jackson Pollock in, POLLOCK. Harris' choice to compose the original score for POLLOCK was veteran television composer, JEFF BEAL. Some eight years later, the two creatives connect to bring Robert Parker's novel, APPALOOSA, to the big screen. APPALOOSA is a small story built in classic, western fashion, yet somehow within its details, remains somewhat fresh. With Harris at the helm, he also stars in the film alongside his brilliant cast of Viggo Mortensen, Renee Zellweger and Jeremy Irons. 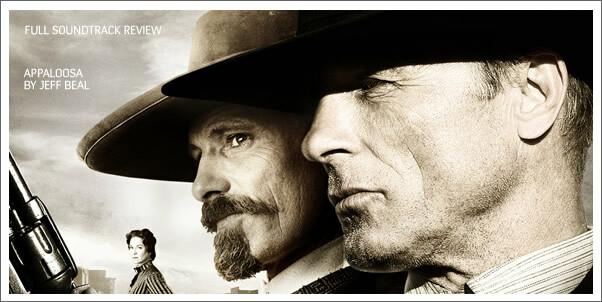 In much the same way 2007's 3:10 TO YUMA was much more about the characters than the settings or action, APPALOOSA focuses on the noble but imperfect hero of Virgil Cole (Harris), his deputy Hitch (Mortensen), their skirmish with the murderous Randall Bragg (Irons) and the unscrupulous woman, Allison French (Zellweger), who is set in the midst of all three men. With such an emphasis on character and performance, the door was left wide open for composer JEFF BEAL to help define each.